The Camu Camu fruit (Myrciaria dubia) contains the highest documented quantity of natural Vitamin C on earth, usually about 5 to 6% naturally-occurring Vitamin C. Virtually all Vitamin C supplements are chemically synthesized molecules such as ascorbic acid, potassium ascorbate, magnesium ascorbate and/or calcium ascorbate and are often made from genetically modified corn sugar. Synthetic Vitamin C does not provide the many benefits found in 100% natural Vitamin C.
Compared to oranges, Camu Camu contains 30 times more Vitamin C, 3 times more niacin, 10 times more iron, double the amount of riboflavin and 50% more phosphorus. 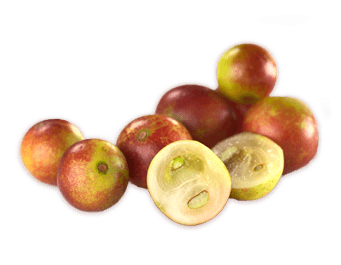 Camu Camu also contains 711 mg of potassium per kg. Camu Camu also contains calcium, beta-carotene, protein, leucine, thiamin, valine and serine. Its wide range of amino acids and minerals greatly promote Vitamin C absorption.